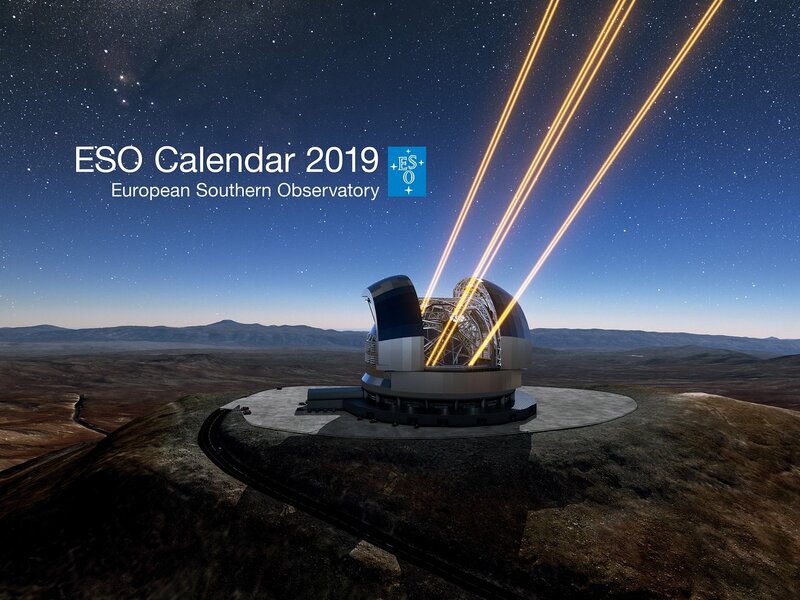 One of our most popular products, the ESO Calendar, is now available in its 2019 incarnation, and can be purchased from the ESO online shop and in the ESO Supernova Planetarium & Visitor Centre. The calendar’s cover features an artist’s impression of the forthcoming Extremely Large Telescope (ELT), the world’s biggest eye on the sky. Inside, the calendar is packed with spectacular images of the cosmos as well as photographs of ESO’s telescopes against the backdrop of the striking Chilean landscapes. 2019’s ESO calendar contains some beautiful highlights. For the month of April, the bright band of the Milky Way arcs above Antu, one of the four Unit Telescopes of ESO’s Very Large Telescope. The spectacular barred spiral galaxy, NGC 1398, is the chosen image for July and a beautiful sunset over Paranal, taken from Cerro Armazones (the site for the ELT) is featured in August. Finally, for December, three telescopes situated at ESO’s La Silla Observatory in Chile are shown gazing up at the spellbinding night sky. This long-exposure shot captures the apparent motion of the stars as they sweep out circular trails across the Chilean sky. The calendar has a total of 14 pages, and is available for 10.00 EUR in the ESOshop — but stock is limited so don’t delay!